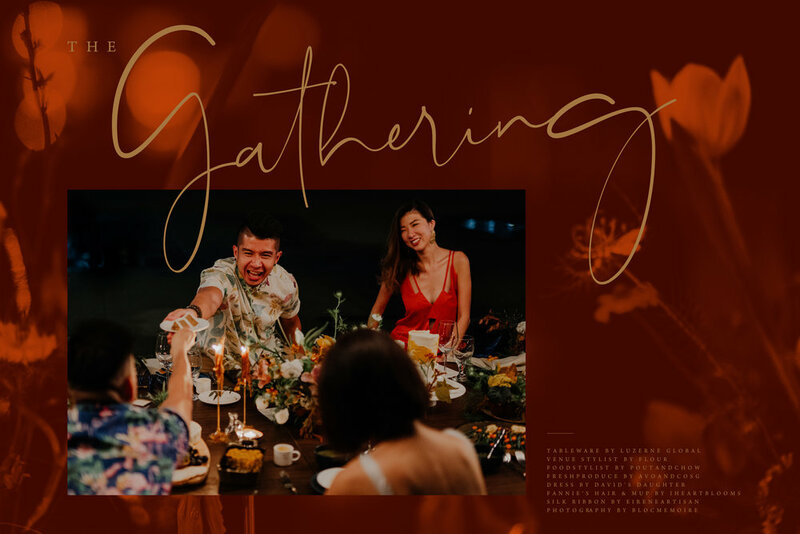 Nestled atop of a rooftop in the heart of a bustling city, The Gathering | Le Rassemblement celebrates conscious living this holiday season. Intimacy and intricacy of a magical gathering is the key to the heart. From hues of warm floral and foliage Ikebana, mulled wine starter packs as party favours, scintillating beeswax candles that illuminate the plant-based table spread, to bagging home a bouquet of flowers in recycled bags, they exemplify the spirit of a modern Christmas. Teaming with a collective of creative brains, we introduced an unconventional, warm and edgy colour palette to set the vision of a Conscious Christmas. We escaped from the overconsumption wormhole, practiced mindful buying, and repurposed our owned materials to reduce wastage. Essentially, we hoped to inspire YOU that beauty does not come with a heavy price!